Scott reiterated that statement when asked by The Washington Blade if he had a message for the LGBT community. He added, “This was an attack, what else can you say?” and “The biggest thing we do now is ask how to make sure this doesn’t happen again.” He also said it was “horrible” that Noor Mateen, who tried to talk shooter Omar Mateen out of carrying out the attack, did not report her husband to authorities. Scott also posted a message on Twitter using the #OrlandoUnited. Though his history of gay rights obstruction did not go unnoticed by users on the social network. You still fight gay rights in FL. How dare you pretend to care.Shame on you!Show u care by signing legislation for gay rights. You are personally responsible for these 49 deaths and all the other murders in #Florida, where you worked to enable murder. 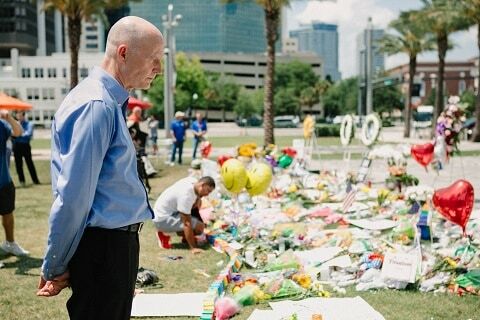 Watch Scott address reporters on the day of the massacre, below.